From Secretary of State for India, London. To Political Resident A senior ranking political representative (equivalent to a Consul General) from the diplomatic corps of the Government of India or one of its subordinate provincial governments, in charge of a Political Residency. att Bahrain. ^0.1403. Repeated Government of India, Simla. Fo.MOi. No.90 dated 6th received 6th X^aMay 1936). 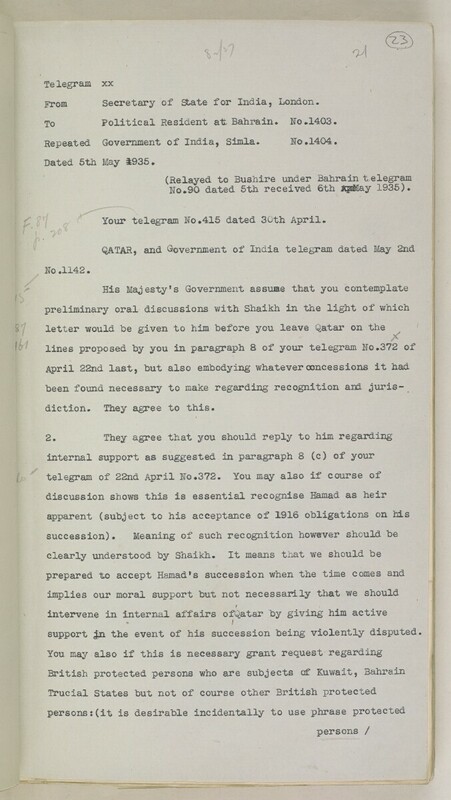 Your telegram No#415 dated 30th April. diction. They agree to this. support Jn the event of his succession being violently disputed.